FREE ADMISSION! From the early 1950's through the 1980's, a group of African American artists known as the "Florida Highwaymen" used vivid and bright colors to display the beautiful untouched Florida landscape. The Highwaymen were mostly self-taught painters who mentored each other. 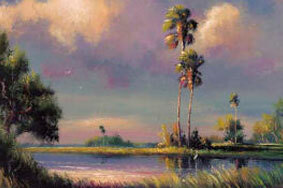 Ben Cowan will be here to showcase a dozen or more Highwaymen Paintings from his collection. They will be available for sale. A portion of the proceeds will benefit the Kane Center's Clubs and Programs. No RSVP required.